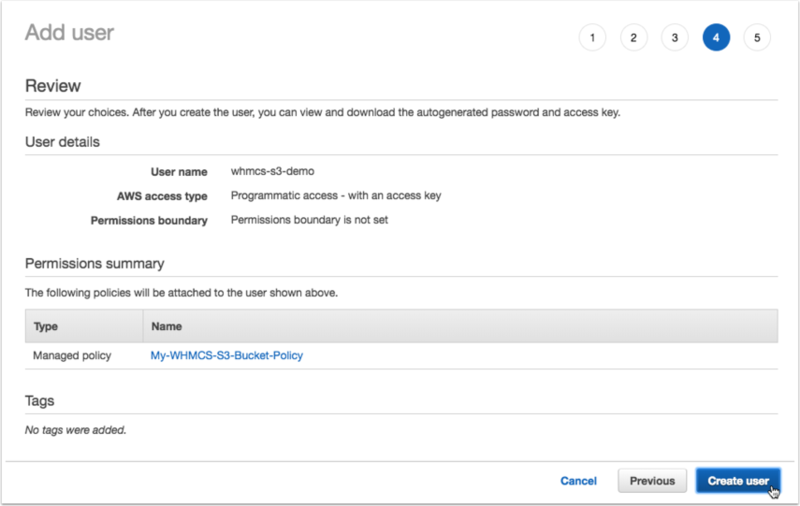 This article describes how to create an S3 Bucket using Amazon Web Services for use with WHMCS as a Storage Provider. Next, navigate to the S3 service. Enter a name for your bucket and choose your desired region. Configure all other settings as desired. In most cases using the default settings for a non-public bucket will be fine. Next navigate to the IAM service. Select the Users tab on the sidebar and then click Add user. Enter a user name for your user and check the "Programmatic access" option under Access Type. Then click Next. 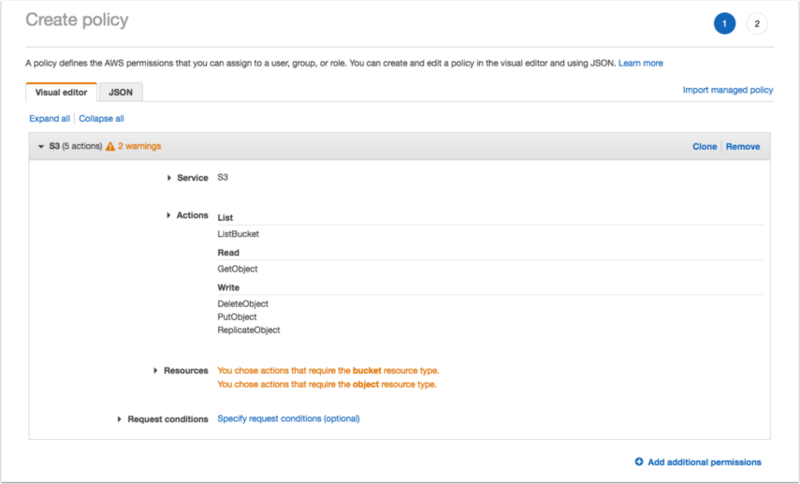 On the following screen, select "Attach existing policies directly" and then click the "Create policy" button. 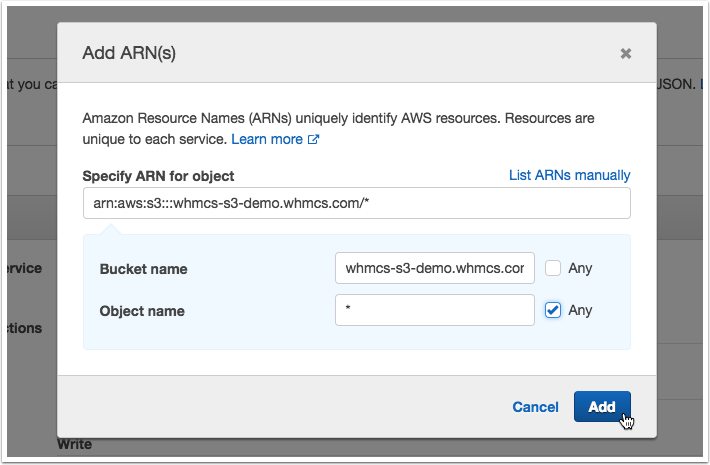 Under Resources, select Specific and then click the Add ARN link under the bucket subheading. 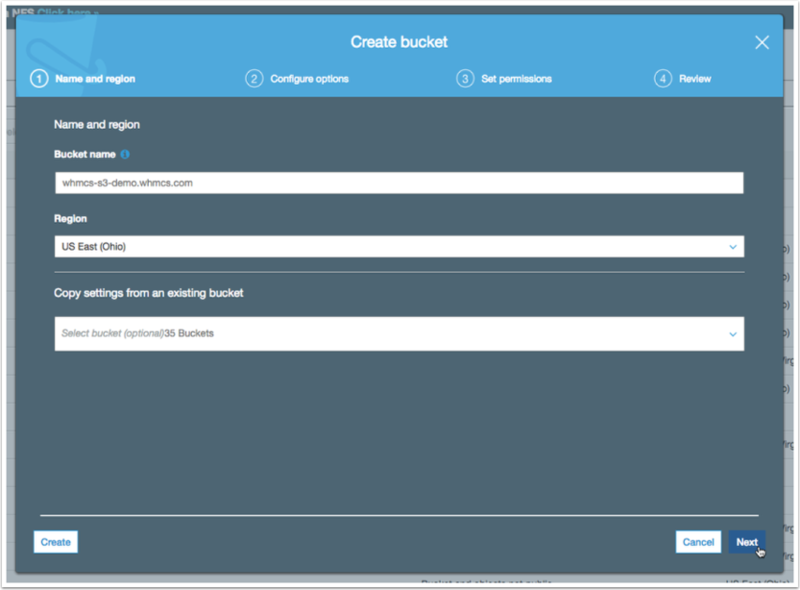 Enter the name of the bucket that you created earlier and then click Add. Now click the Add ARN link under the object resource type subheading. 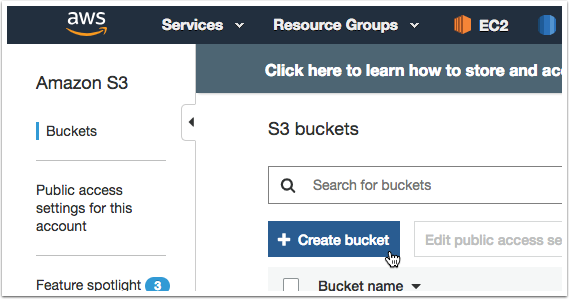 Enter the name of the S3 bucket you created earlier into the Bucket Name field, enter check the Any checkbox for the Object Name field. Then click Add. 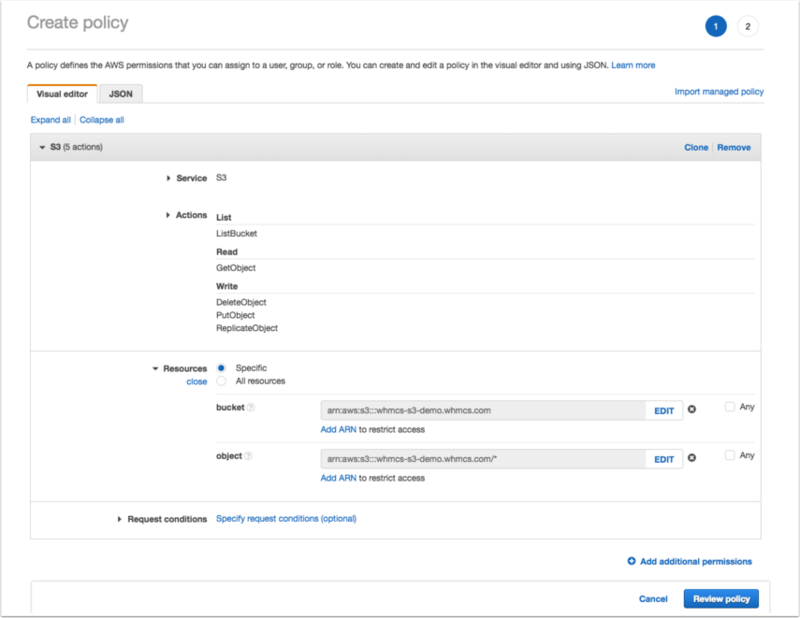 The Create Policy screen should now look as follows. Once you are happy with the values, click the Review Policy button to continue. Enter a name for the new policy and optionally also a description to help you identify it later. 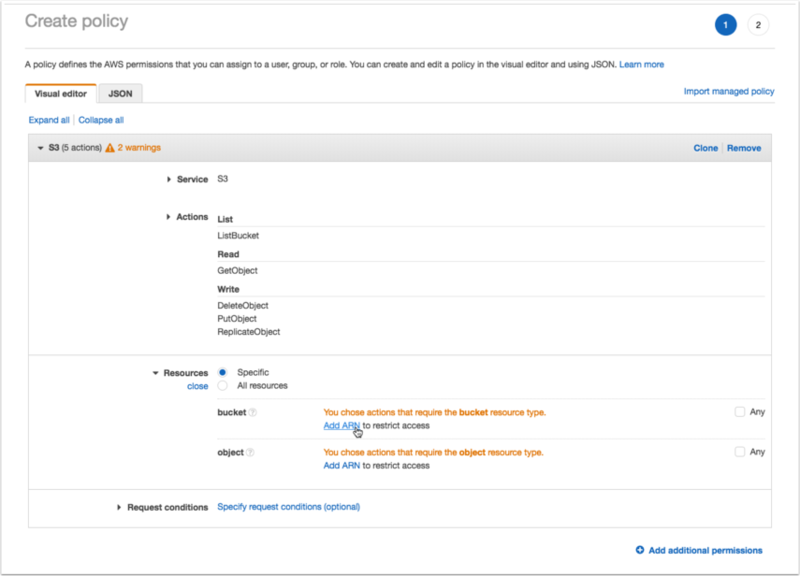 Then click Create Policy. You will see a successful confirmation as follows. Now return to the previous tab where you began creating the user and refresh the list of policies. Enter the name of the policy you created into the Search bar and then select the policy from the search results below. Next you will be asked to assign tags. Assign any tags if desired, and then continue to the Review step. The review screen should look like the one below. Once you are happy, click Create User to complete the process. On the following screen you will be provided with the programmatic access key ID and secret. Copy these and store them safely. 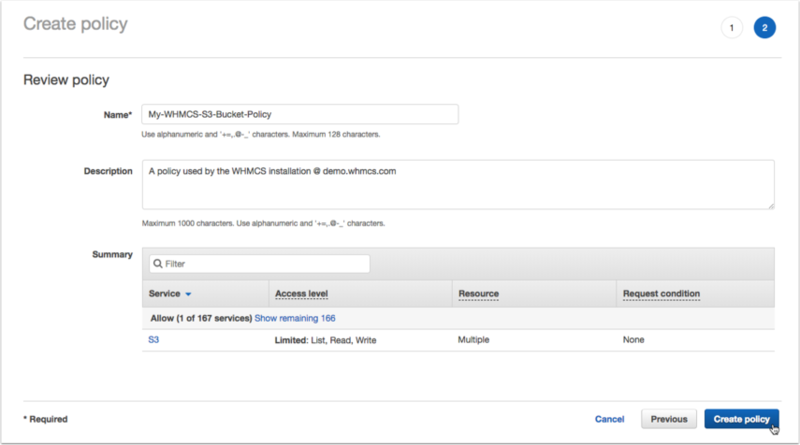 You will need them to configure WHMCS. 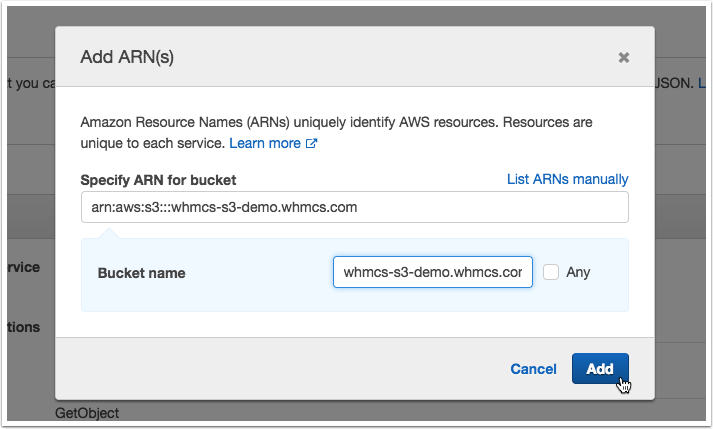 You may now continue to the article for setting up S3 inside WHMCS. 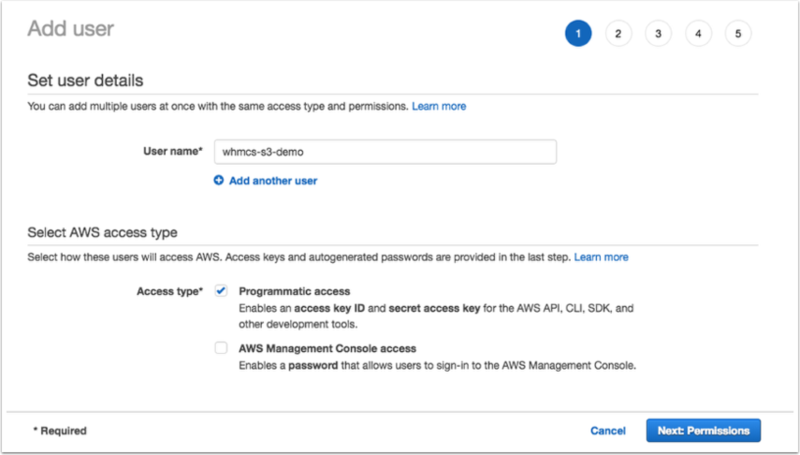 Prev: How can WHMCS help with GDPR compliance?